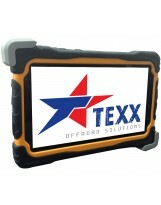 TABLET TEXX 7001 IP67 RUGGED IDEALE PER FUORISTRADA OFF ROAD E 4X4. SUPPORTO PER AUTO CON VENTOSA E SPEDIZIONE INCLUSO NEL PREZZO!! !